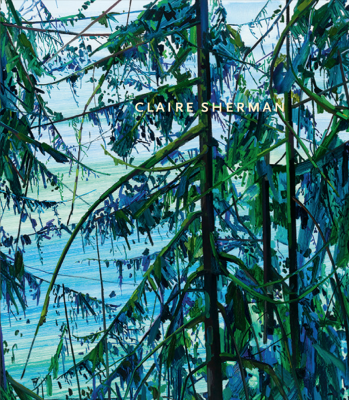 DC Moore Gallery is pleased to announce the opening of West Ridge, an exhibition of new work by Claire Sherman. Sherman’s paintings of exposed islands and chaotic forest interiors challenge us to encounter unpredictable, wild nature through the emphatic materiality of paint. Existing in tension with landscape archetypes, the paintings, like the exhibition’s title, evoke specific places that could also be anything, anywhere. Sherman distorts scale, color, and perspective to create “unraveling environments.” Branches bowed by fringes of moss sweep across the canvas and plunge back into space. Angular limbs appear silhouetted amidst the searing blues and agitated brushstrokes of the night forest beyond. In these works, the artist’s approach to subject matter and paint handling finds a parallel in her interest in epiphytes—plants that grow on top of one another in the tree canopy. Works titled Island seem to punctuate the frenzied, dense tangle of the overpowering tree paintings. Surrounded by empty sky, the centered masses test the limits of canvases already over eight feet tall. Each sheer rock face is made up of impossibly long drags of vertical paint and short compressed marks that register as geologic strata while simultaneously indexing the pace of the painting process. Claire Sherman has exhibited widely throughout the United States and in Amsterdam, Leipzig, London, Seoul, and Turin. She has completed residencies at the Terra Foundation for American Art in Giverny, the MacDowell Colony, the Lower Manhattan Cultural Council’s Workspace program, the Marie Walsh Sharpe Foundation, and Yaddo. She graduated with an MFA from the School of the Art Institute of Chicago in 2005. An Associate Professor at Drew University in New Jersey, Sherman lives and works in New York City. West Ridge is her second exhibition at DC Moore Gallery.